• Molded Stairs Prevent Drowning Of Smaller Reptiles and Amphibians. • Smooth Non-Pitted Non-Porous Surface Will Not Absorb Bacteria Stain Or Leak. 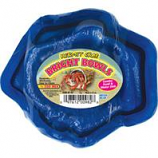 • Deluxe Reptile Water Dish With 22 Oz Capacity. • Large Reservoir Provides Fresh Water Small Basin Discourages Rep From Fouling Water Cricket Guard Prevents Insects and Small lizards from getting stuck. Automatically feeds your turtles daily. 12 hour sleep function at night to prevent waste. Can be mounted anywhere-rotates 360. 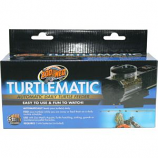 Use with Zoo Med Aquatic turtle hatchling growth maintenance and sinking formulas. .
• Allows Easy In and Out Access For Your Turtles, Salamanders, Frogs, Etc.